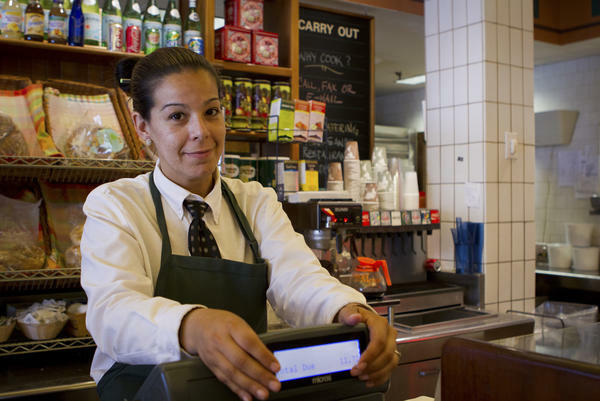 Sally Teixeira studied to be a medical administrative assistant, but works at a deli in Cambridge. She's hoping for debt relief from the federal government. It's Sally Teixeira's job to make sandwiches at a busy deli counter in Cambridge, Mass. Six years ago, when she was in her mid-20s, she graduated from a job program for medical administrative assistants, with the idea she'd be making at least $20 an hour by now. But, "I can't get in anywhere" she says. "It's frustrating." Instead, she earns $11 an hour at the deli, and has $10,000 in student loan debt, from attending the now defunct Corinthian College Everest Institute. Boston has tons of hospitals, but none of them have hired her to do what she's trained to do. "I don't know if it's because they see Everest on there," Teixeira says, talking about her diploma. "I'm fluent in two different languages. I have experience in medical records. So it's like, 'Why can't I get the job?' "
Earlier this year, Corinthian Colleges closed all of its campuses after the Education Department found it guilty of misrepresentation and fined the company $30 million. Corinthian says it didn't do anything wrong, and plans to appeal; in the meantime, it's sold off most of its campuses and filed for bankruptcy protection. NPR Ed has written a lot about the Corinthian shutdown, and now the federal government says it's poised to forgive college loans for tens of thousands of students who attended the schools. At its peak, it had more than a hundred campuses. Teixeira is among 15,000 former students who could qualify for loan forgiveness because their specific school shut down. The government says at least another 40,000 Corinthian students could qualify based on misleading claims made by the colleges. The department has created a new position, "Special Master," to oversee discharge claims in cases of predatory lending. Students eligible for relief will have to apply individually, and demonstrate that they were deceived. Student advocates say this process is too much, and too slow. A group called Debt Collective represents former Corinthian students who want to stop payments on their loans immediately. "Students are entitled to receive full relief under law. The legal and most painless possible process for students is no process—they deserve an automatic discharge of their debts," Laura Hanna of Debt Collective said in a statement. Brittney Patient, who's 25, could use some of that relief. She's defaulted on her $9,000 loan that she took on from Corinthian's Everest College when she was a young single mom with no high school degree. She remembers sitting at home watching midday TV when the Everest commercial would air. "And every single commercial is the guy standing in front of Everest Institute," Patient says. "'Get off the couch. Call now. Make the best decision of your life. Go to college. Eight months. You get the certificate. You're done.' And then they repeat the number like 17 times." She says she called the number because she wanted to make her son proud. "I wanted more than anything to show him that the way of life isn't the way that I was brought up," she says. "I wanted him to know you go to school, you learn, you get a degree." At Everest, Patient says a recruiter pushed her to enroll and promised her a starting salary of at least $22 an hour. "I just felt very rushed and I said, 'Well, Brittney, if you don't do it now, when are you gonna do it?' And I did it and it was one of the biggest mistakes of my life." She hopes the government will forgive her loans later this year when the Education Department makes recommendations on debt-relief claims. Meanwhile, this week the Department enacted a new rule that requires most for-profit and certificate programs prepare students for "gainful employment in a recognized occupation." Meaning graduates must achieve earnings that enable them to easily pay off their student loans. For Sally Teixeira and Brittney Patient, debt relief would save them thousands of dollars, but it wouldn't help them with the problem that lead them to Corinthian in the first place. That is, how to find a better career.